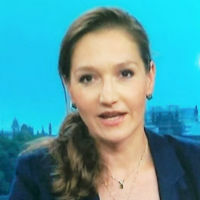 Russia cannot afford to solve the financial problems in Greece and a bail-out deal would be "difficult to imagine", according to City's Professor Anastasia Nesvetailova. 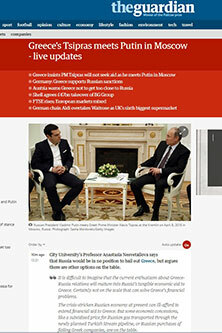 The Director of the City Political Economy Research Centre made the comments as the Prime Minister of Greece travelled to Moscow to meet with President Vladimir Putin. Amid some speculation in the media that Russia may offer financial assistance to the struggling Greek economy, Professor Nesvetailova says the Russian economic "crisis" means the country cannot afford to help. She also believes the display of co-operation between the two countries is short-term "political gesticulation" directed at the European Union (EU). “It is difficult to imagine that the current enthusiasm about Greece-Russia relations will mature into Russia’s tangible economic aid to Greece," she said, "certainly not on the scale that can solve Greece’s financial problems. “The crisis-stricken Russian economy at present can ill-afford to extend financial aid to Greece. But some economic concessions, like a subsidised price for Russian gas transported through the newly planned Turkish Stream pipeline, or Russian purchases of failing Greek companies, are on the table." Greece's Prime Minister Alexis Tsipras met with Vladimir Putin at the Kremlin in Moscow on Wednesday 8th April. Professor Nesvetailova, from the Department of International Politics, points out that the financial crisis in Cyprus in 2012 did not result in assistance from Russia and suggests this is a sign of the country's ability to aid Greece. “When Cyprus, a tax haven and the largest FDI investor in Russia, was hit by the financial crisis in 2012, Russia – at that time in a much stronger economic position – did not bail it out," she said. The academic has assessed the possible economic gains to Russia of assisting Greece, explaining these are "questionable" and says Greece itself could only expect limited benefits from the relationship. Her analysis was used by the Guardian newspaper as part of its live online coverage of the developments in Moscow. She said: “To Russia, the economic gains on many of these potential investments to Russia are questionable. And it is clear that both sides are using this moment for short-term political gesticulation directed at the EU. “The best case scenario for Greece that can come out of Tsipras’s visit to Moscow would be the removal of the food embargo on Greek agricultural exports to Russia, Russia’s financial participation in the privatisation of Greek enterprises and reduced tariffs on Russian gas. “This would be by no means an insignificant result if it does come through, but a drop in the ocean considering the scale of financial and institutional problems in Greece. “The benefits of any economic deal for Russia, in the current framework, are more uncertain. Russian consumers would like to see fresh fruits and vegetables return to their supermarkets shelves. A bilateral trade deal will boost some economic sectors in Russia. But beyond this, friendship with a ruined Greek economy will ultimately add to the pressures on the ailing economy of Russia." Professor Nesvetailova points to the Russian domestic coverage of the meeting between President Putin and Prime Minister Tsipras as an indication of the political motives behind the talks. “It is indicative indeed that in Russia, public discussions of Tsipras’s visit are unavoidably referenced by comments about the reaction to the visit by EU leaders," she said.